The picture makes this look like a simple tank top. In person it is quite striking as it is made out of rayon and nylon so the knit has a nice luxurious feel and hang to it. The sequins are real and sewn on, not sequin dots. The mix of blue and iridescent lime or goldish ones produce a wonderful array of sparkling color. The stretchy tank could be worn loose or fitted. I believe is is an 8 fit. The chest is 36" before stretching and can easily stretch to 40" without being too tight. 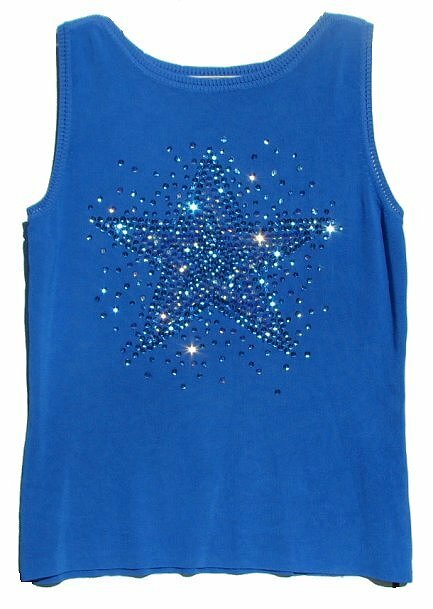 The sparkling top would be worn with jeans or variously colored satin disco pants. It possesses a timeless look. Hand wash in cold, dry flat.